Follow @mcphoo Tweet Getting Lean. It's what i'm focused on now, and building strength on top of that. Sounds so clear and strong a resolution. But this focus began to emerge, only half baked, end of april, once the shoulders i'd been rehabbing started to feel almost usable again, and i did my first round of bioletics blood work back. I'd been working out with the ineffably named War Machine for a near month on the road (a life saver that thing in a hotel room); i was feeling stronger than i had in awhile - and I decided i wanted to explore lean. What does that mean? going from 19-20% bf to maybe 14-12% ish - not sure, but i'll know when i get there. But why am i trying, and why talk about it mid way in? That's what this post is about. I hope. I am interested in the relationship to be found between leanness and strength. Leanness and potentially muscle. I just saw a very lean illegidly 114 pound gal deadlift 335lbs. had not been wearing squishy trainers and had not been cranking her neck back. I heard the other day about a gal, Valerie Hedlund, at 125lbs and 5 foot 4 doing the women's "beast challenge" (discussed here with fellow women's beast tamer, Asha Wagner). So, one can be small(er than me, it seems) and strong(er than me). Can i? What is that process like? I'd like to share some of my process so far on this path. I feel like i'm at a half way point, so a good time to check in for later reflection. Goals, Focus, Decision. One of the things i've come to in this process is made a descision about my strength practice vs my nutrition practice: hitting my lean target is my priority; strength goal is secondary to that. If i hit my lean target and i simply cannot get my strength target from there, well that's information, and i'll go from there. But i have no idea if that is possible or not to put the two together. So i'm not gonna prejudge that: let's go there and find out. Fuzzy Start. Getting to that decision was not obvious initially, so i'm gonna come back to this fridgid clarity of purpose. But no, in fact the process of getting clear on process / reality of practice, was not even on the horizon. When i got my blood work results back and had my first conversation with the bioletics folks about my results and my goals, all i knew is that i wanted to burn some fat: i was frustrated with where the scales just seemed stuck, especially as i'd been picking up my workouts again with my arms much more back in commission. They made some interesting suggestions about tuning my diet first and foremost to get some of my target levels into the zone i wanted, and second how doing so would likely let me get onto the path. The Path The suggested changes to my diet felt a bid odd. A colleague of mine, Zach Salazar, right at this time recommended the Perfect Diet - which i read. My take? some really interesting reading, interesting notes on iodine and sellenium (that i'll come back to in a future post), but gosh, i just can't do the legumes are evil thing or that whole grains (i mean whole, particularly sprouted) grains are evil either. Nutrient timing, a la espoused in Precision Nutrition, i'm all for; cutting out starchy carbs or really reducing them when trying to lean out - all over that too. But evil? What that book did foreground for me as well was the introduction to coconut oil and the invention (i'm calling it that ) of Fat Tea, discussed here. Did that help me lose weight? No. Which i'll come onto in a moment when we discuss "less"
Back on the Road and grooving some "eat...stop...eat). The second thing that happened post biotest was that i was back on the road. Usually this is a nightmare for good food. So i took it as an to explore fasting again. What i learned is that Brad Pilon is right: fasting once (he adds "or twice") a week can really kick up some fat burning goals. Now as a gal i'll say timing one's fast not to collide with one's pre-period may be a good idea to avoid heavy metal headache death, but otherwise, good to go, and your mileage may vary. Eating LESS. Happiness for me was getting back from several weeks of work travel and finding that i was a bit lighter than when i'd left. Hmm. This is when i clued in to a really really really basic principle but at a very applied level: eating less works, and i had to eat less. I had kinda deluded myself into thinking swapping out some stuff for medium chain triglycerides and all sorts of fatty goodness would somehow take the place of - eating less. But no. Nothing really moved. If we're not losing weight; we're maintaining, we're consuming at a level place for energy expenditure to more or less equal energy intake. Bummer. Eating less works. So I refocused to going for less, deliberately, focusing on Precision Nutrition principles of especially starchy carbs ONLY post a REAL workout, and greens and protein and any feeding along with healthy fats and, other than that - less. Of everything. With the occasional period of not eating thrown in - sometimes half a day of stop; sometimes more. When i saw the weight line moving - finally and consistently if slowly - this is when i dialed in the focus: i want to explore lean - real, athletic lean. Exploring Lean. 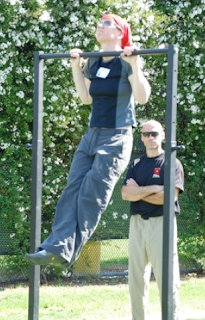 It's important for me to note that it was only when i arrived back at a weight i'd been at a few years ago when i was prepping for the tactical strength challenge and felt really good in my body that i thought i'm here but this isn't it. This isn't *lean* in the way i'm thinking about it. I guess part of me has been saying: i've been here before; i have had a challenge holding here before, and i don't want that to be the case; instead, i want to keep going; i'm not done with this, this time, yet. So, what i want to know is: what does it feel like to be leaner AND stronger. I won't say "but leaner first" - i will say, with lean as the priority. My hope/goal is to hit there sooner than later - in a few months - and still have more time to build up the strength in a leanness buffer zone. What is lean? why is that important? You know there are many health benefits assigned to leanness, true, but one doesn't have to hit below the teens for a gal to have them. It looks nice to some, especially with some muscle to shape spaces, but one doesn't have to do that to look nice or be stronger. In fact some argue that leanness may challenge capacity for strength gains. But, as John Berardi has said when he talks about his bi-annual fat shredding, he talks about it as a discipline too, along with all the health benefits. I think that is part of my motivation now, too. I want to explore this not just as an end, but as a practice. A practice of getting there. Strength Practice Right now, i'm also back into training Return of the Kettlebell and i know what i'd like to achieve - but originally i thought i'd have till next July to hit that goal; now the meet time is moved up to April - so we'll see what can be done between now and then on the strength side. To be clear, maintaining health is the uber-if-implicit priority. Everything else bows to that. All things being equal though, lean, with strength, get to lean, focus more on strength, with lean in maintenance mode. I remember clearly how much i weighed when i was running cross country in grad school. I feel like i'm in much better shape and actually stronger now than i was then - and also heavier. So i'm curious: what is possible at that leanocity in terms of strength, with steady deliberate practice? As a more experienced practitioner now than ever a few years ago, can my training be even better than it has been - while saner and healthier (no more hinky shoulder stuff; they're still not 100%). Isn't it amazing how something as simple as burning calories can be so effortful? Simple (eat less) but effortful. All the hormonal cues and hedonic practices signaling all over the place not to stop the fuel; to enjoy the tasty succulent goodness of it all - that this one little thing couldn't possibly make that much difference. Uh huh. Withings Scale This scale is so cool in design but it's one particular function that makes it awesome: local wifi. That's right step on it and forget it. One's weight, bodyfat and bmi is hived off to the Withings server where it can be viewed as a set of points and the all important trend line over time: despite ups and downs, the trend is DOWN. What really surprised me is that the bf% calculator (impedence) with its variety of algorithmns is pretty good - off a couple of percent compared with 7 point caliper testing (again, fully described in precision nutrition) - but good enough to see the trend. Zeo. One of the biggest pieces of the workout/nutrition puzzle for me that's been coming into focus is just how critical recovery is. Sleep is also important for weight loss. Let me rephrase that: suffient number and completeness of sleep cycles is key. With the zeo, i can see at a glance the quality of the cycles i have had and can correlate that with what i ate and especially what i did (or didn't do) the day before. One big deal: like Zeo sleepologist Stephan Fabregas has made clear, caffeine can bugger up one's deep sleep. Since pulling back on any caffeine after five pm, sleep cycles have been better and less interupted. That's better for weight loss and muscle building. AND i can see this against the scale readings in terms of weight fluctuations. FitBit and NEPA's. I've become very keen to see if "every little helps" when one is pushing the edge towards lean, so non-exercise physical activity - and time of movement is of interest to me. FitBit, as described in the "is 10k a magic bullet for steps" article makes it easy to track steps taken, intensity of steps in any period, and when these steps are taken. My question is: does sticking with the 8k steps min a day (the low end of the 8-11k prescription from that article) help make the differences to leanness or not as per Chris Shuggart's contention? On another point: seeing the numbers on the fit bit through the course of the day i have noticed does give me a nudge to get my stepping on if it drops off. Resting heart rate and grip. Two things i've only been monitoring casually are my resting heart rate and grip strength. Time to start logging these too i suppose. Resting heart rate is a long time indicator of imrproving cardiovascular well being. So a resting heart rate that goes down overall sounds like a good thing. If it's a-typically high, and it's a workout day, a good idea to switch to mobility practice that day. A more fine grained instrument is heart rate variability - and really i haven't been tracking that at all (wrote about it here for those interested). Instead, i've been looking occasionally at grip strength at the start of the day: i know how close i am to jamming a gripper shut: ancient russian sports science says if you're grips worse on a given day, do something else than heavy stuff (auto-regulation). Even clearer: if there's a gripper i can close pretty regularly and then can't that day? definitely a day needing some more recovery. Walk, bike, throw frisbee, do mobility. Read a book. Outputs from many of these tools are being integrated by others. Our lab is looking at things like what's the best way to represent all this data: weight, blood pressure, steps, sleep, heart rate, breathing etc etc for people to make sense of it. There are some apps for iphone/android that are letting one see individual graphs from many of these sources in one place. Runkeeper is at the forefront of these efforts so far. what's the reading on the scale this morning relative to that? up or down? 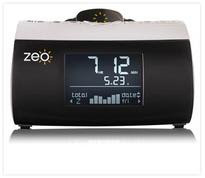 what's the zeo say about sleep? good or not? how am i actually feeling? chipper or wiped? if i'm dubious, i check my grip. When i'm sitting at night, i check my resting heart rate. Every fortnight i also do calliper measures for the 7point scale, and measure my main measure areas: hips and waist. Those are recorded, too. They are more consistent than weight. How's that for an epigram? Progress is slow but consistent. It's slow because *i* have to re-adapt to consistently eating less than before it seems, and moving more. I feel like i mini-plateau rather frequently, and that can be a bit discouraging. For folks who may take a week to lose a pound, it take me nearly a month now to really break a pound plateau consistently. But then there's that trend line. And my other measurements that say "it's working; don't stop"
As said i'm at a half way point just passed where i've been before when training, but not this consistently, and not below that level so consistently. My strength training has also been tuned with notes from last time with RTK from Randy Hauer (recommended coach) and double press coaching from colleague buddy Ken Froese (you remember him? the man who trained for Spite, and triple double beast pressed?). Patience i'm learning really is a virtue, and perhaps all this data collecting is just a way to help not go mad with the pace of progress: yes there is progress in both strength and leanness. I will arrive at the one, and continue with the other. This really is an experiment to go further than i've gone with a deliberate quest to explore leanness and strength. So this is new to me. This kind of discipline of eating is new - since typically i'd be done by now - i'd be at my goal weight and just going for more strength. Reminds me of when i was a kid and i had to let go of this branch and to get back to the ground. I fell, and have this clear memory of thinking "this should have stopped by now" but i kept falling. That's kinda what this as like (though not quite so easy). I've been to this point before, and i'm finding that experience seems to be sharpening my focus for where i want to go now/next. So why this post now? Because i guess it is at a point where i'd previously say, well that's done, and to see it now as only half done, is an interesting perspective shift. And i'm a little nervous. I'm also wondering about the experience of a goal becoming clearer once one has passed the point of the previously known to be possible - if others reading have experienced this, and what happened? the number one place to start and spend time is still nutrition. Then dialing in recovery awareness from a workout - including when to stop a set. Then the workout practice itself. I find myself really enjoying the skills focus right now as i rebuild my shoulder strength. Maybe we can talk about that another day. Within that, eating less works. Now buddy brad (pilon of eat stop eat) likes for weight loss work to eat some less overall, but to combine that with fasting full 24 once or twice a week. Awesome. Me, i like as said following the Precision Nutrition hueristics and kicking in a fast once or twice a month, and some micro stop eats within that. I find i'm just not working hard enough at this point to give myself the license to do starchy carbs right now more than half a spud at dinner if i feel like it. Even weekend pizza has become a more monthly-if-that than weekly or biweekly thing. Moving more but not so hard. I'm keen to see if NEPAs will continue to help keep the trend going down the way i want for fat and up for lean. Blending nepas with some intervals/faster cardio a couple times a week? i was doing that till my heavy workout days got heavier - so we'll see. Recovery is still king and gaiting my workouts to support recovery is affecting everything from intervals to volume to nepas. It's kinda risky to report on a mid point. What if i don't make it and have no ta-da to report? I guess i'm also really then posting to see if i'm not alone in going past a place one has been - higher up, further in, and if i am indeed on a Righteous Path.